Since last year I have been active in Running and Biking. I have been joining run races and have in my own way tried to motivate friends to engage in running and in fitness in general. Running has become a way of life for me. Thru running and biking I have developed a sense of self-discipline and made a big impact in my transformation both in my personal and professional life. In every race there is always preparation and training to be able to perform better and achieve whatever goal you set. While I was active in preparing for my sport, I have been preparing also myself to a very important race of my life. A life marathon with the most important person in my life - KAY. In June 11, 2010, I have tied the knot with Kay to whom I have committed to spend the rest of my life with. Together we will run along side each other and make worthy the bond that we share together. It will be a long journey, there will be hills and valleys along the way but together we will be able to overcome it and make this a successful journey. Photo courtesy of Ma. Theresa Santos. 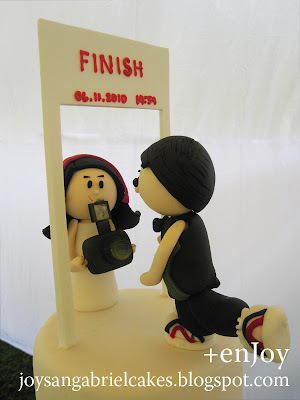 Our cake topper care of Joy San Gabriel. As inspired by running we chose this concept. Usually if Kay is not running in a race, she is usually waiting at the finish line with her camera. Wow. Congrats. This is a long run you are sure to enjoy.